This is one of my entries into Tessuti Fabric’s latest sewing competition. It wasn’t my Plan A, which is why I now have the opportunity to make two garments instead of one. Plan A called for a LOT of fabric, but after nearly two weeks of literally dragging myself through every sketch and stitch of the design process, I still wasn’t feeling it. And then suddenly, like blow to the head, Plan B occurred to me. It’s amazing how sewing can turn from feeling like an absolute chore to the best thing in the world. And when things go well, I find that they also go fast! I stay up too late. Netflix and Nurse Jackie are my companions… oh hello there Oonaballoona! (That must be a sign I should keep sewing and not sleeping!). So to cut long story short, Plan B went ahead like a dream. I began with a pattern I’d started last year. I’d already spent a great deal of time draping this pattern from scratch, fitting muslins, and even making a wearable dress. 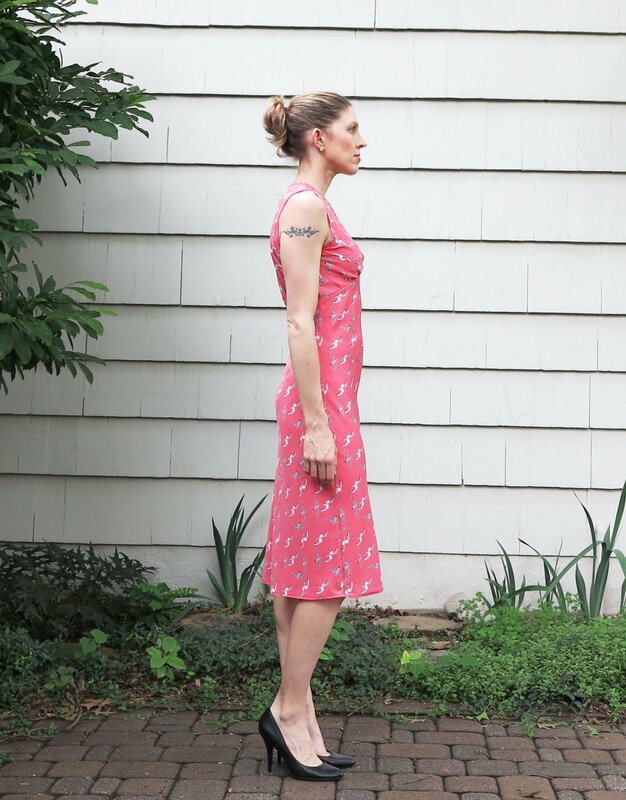 I wore the wearable muslin frequently at the end of Summer and I knew that there were things about the pattern that still needed working out, mainly the fit around the armscye, neckline, and the shape of the skirt hem. I also had a few small modifications in mind. I initially turned the bodice into a kimono sleeve top with shoulder cut-outs. I loved the idea, but the cut-outs looked like they would work better with a set in sleeve. So I went back and drafted some little (shoulder-less) sleeves to attach instead. And I gave them a little point at the hem. 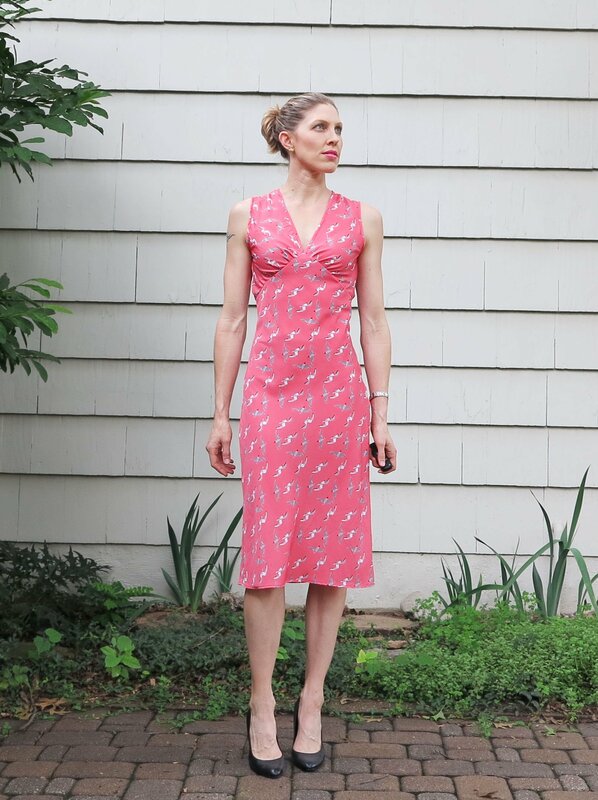 I used self bias binding in the making of this dress. The neckline, armscye, and top of the sleeve are all bound. I narrowly hemmed the sleeves and bottom hem. Although I do love a French seam in silk crepe de chine, I chose to serge the inside side seams instead. The skirt is cut on the bias and a bias cut seam needs to be free to stretch as it hangs to get a smooth result over the hips. I love the way the little sleeves worked out. I also love the curve of the seaming in the back of this dress. I polished up my last version to get the back darts in the bodice perfectly lined up with the back darts of the skirt. It’s hard to see these details in the busy fabric, but they all contribute to the nice fit of the dress. A line drawing helps (so does Fashionary, since my sketching is very, very basic at best). There’s still heaps of time to enter the In Season Silk Competition. I always get started early because I never know what life will throw at me (with three little girls). The fabric I used is sold out, but I think the other print is still available. It’s a really lovely silk crepe de chine (at a really great price too!). The best bit for me is seeing what everybody decides to make. 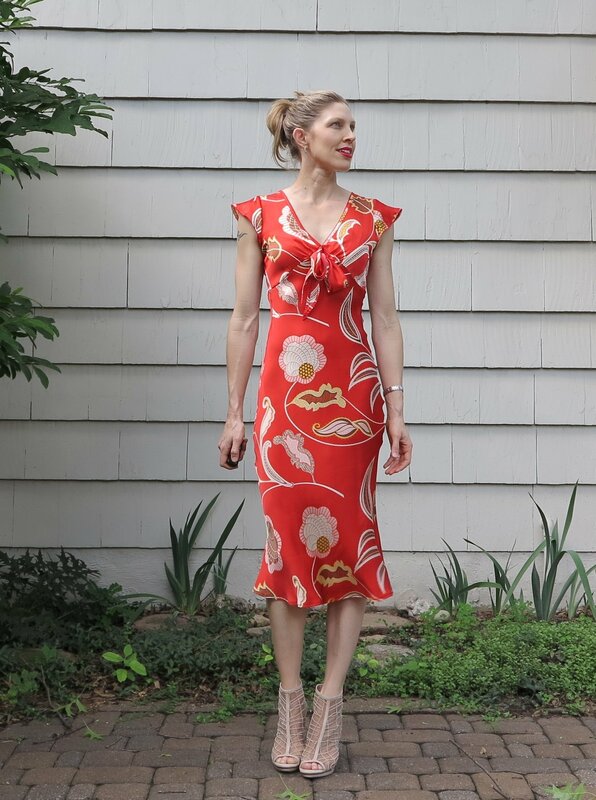 This entry was posted in drape, silk, Tessuti awards, Tessuti Fabrics and tagged bias, bias cut, competition, dress, off the shoulder, self-drafted, silk on March 23, 2016 by Debbie Iles. 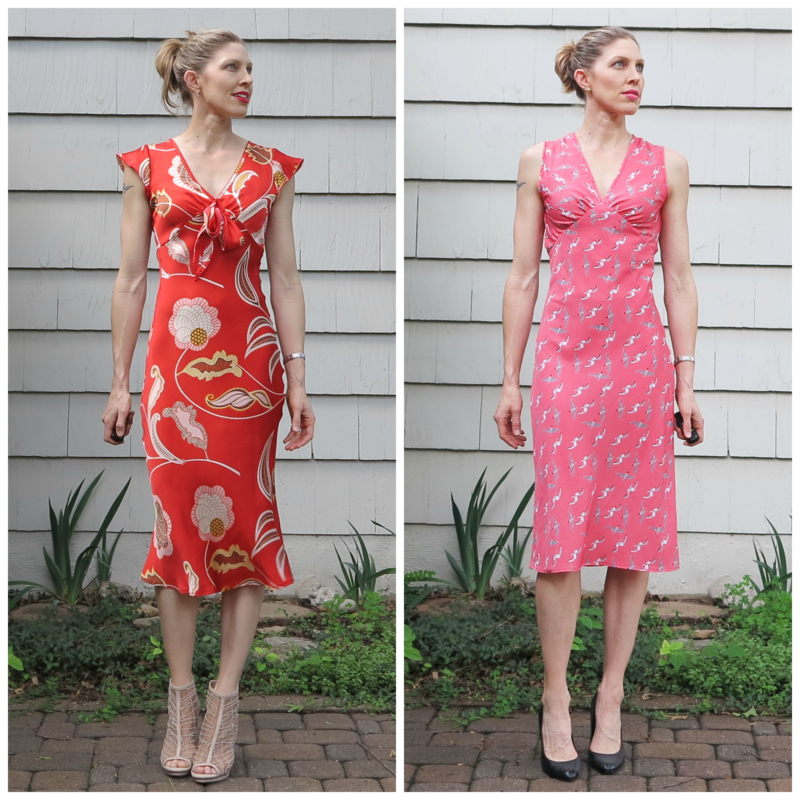 About ten years ago, I purchased a dress on whim from a little boutique in Wells, Somerset (England). I was in my twenties. I didn’t sew. I was fickle with fashion (I still am). I had no idea about fabric back then, apart from the vague understanding that silk was special. This is the dress that caught my eye. It wasn’t the type of dress I’d normally wear. It was silk satin (oh the splendour!) and about three times what I’d normally pay for a garment. I remember loitering in that boutique for what seemed like hours, but I eventually walked out the door with it and I’m so glad that I did. As far as semi-formal dresses go (aka wedding guest/corporate dinner attire), this one has had the most wear of anything I’ve ever bought. I’d been meaning to copy it for a long time now, but I’ve been hesitant because it is bias cut silk. And not recently bias cut either, so whilst it still fits beautifully, it has visibly grown in different places from years spent on the hanger. I wasn’t confident that I would be able to identify the correct shapes of the different pattern pieces. I also don’t sew a lot of bias cut garments. I adore bias cuts but I still find them a little magical. The pattern shapes are different to regular patterns because the bias stretch needs to be taken into account when drafting. I’m sure there is a formula for this but I’m not experienced with it. There are also different techniques for sewing fabrics on the bias. The unknown is further amplified by the fact that slippery, difficult to manage fabrics are the ones that often make the most beautiful bias cut garments. 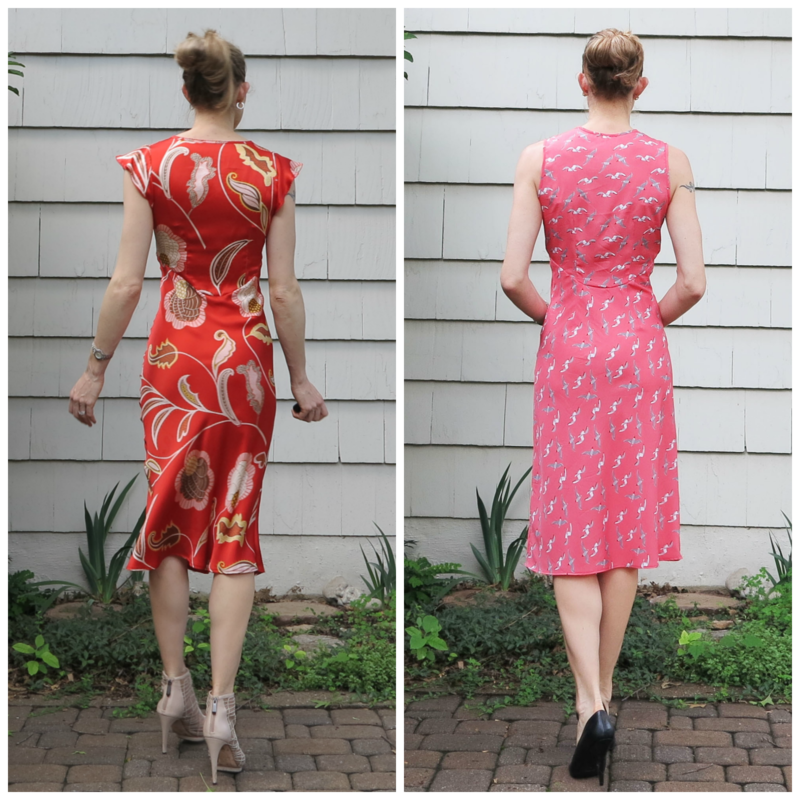 My first plan was to look for a bias cut dress pattern that I could use and adapt. I found two wonderful patterns that I may still sew one day. However, because I had quite specific style lines in mind and was wary about sizing and fit, I chose to drape the pattern on my dress mannequin instead. It took me two calico muslins to achieve a fit that I was happy with. This dress is my wearable muslin. The fabric is inexpensive polyester with a reasonably close hand to silk. However, the drape and bias stretch in this is still less than what you’d get with a beautiful silk satin. The hem of my muslin didn’t grow by anything discernible (by my eye) in a whole week. Because the polyester is a little more stable, there’s less “cling” in my muslin than the original. You want cling with a bias cut dress. But, apart from pressing, it was also easier to sew. I’m very happy with the fit of my version of this dress. Seeing it side by side with it’s RTW inspiration is a great help in seeing what needs to be changed. The skirt needs to be pegged in at the bottom more. Perhaps the edge of the armscye could be moved medially a smidgen in the front. The back is a bit roomier in my version, but this is a good thing. 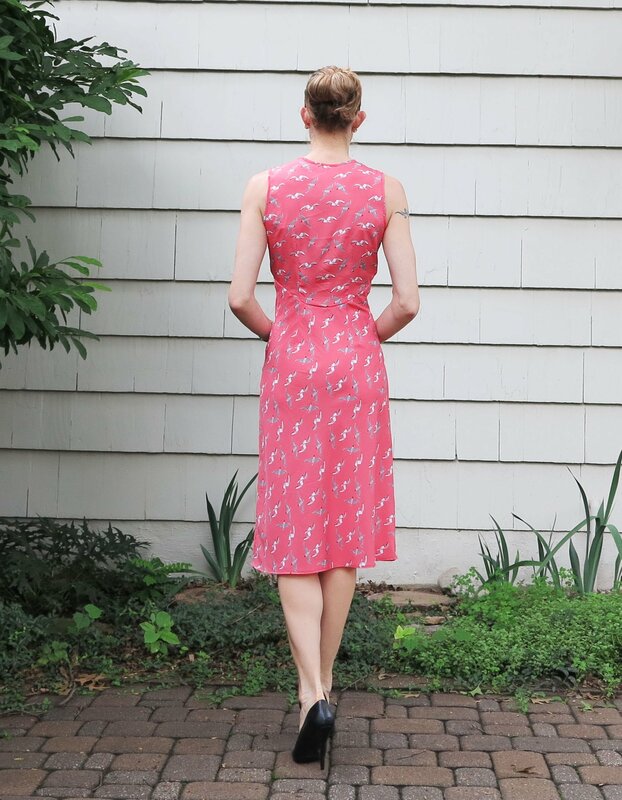 You can’t see it in the photos, but the back darts on my RTW dress are straining and the stitches have been stretched permanently to twice their size. Otherwise, it’s pretty close. Correcting the skirt will hopefully move it from secretary to screen goddess. I might also try some little sleeves in the future. This entry was posted in drape, dress, fabric, satin, silk and tagged bias, bias cut, drape, dress, silk, slip on July 16, 2015 by Debbie Iles.